Volunteers standing around talking with each other instead of interacting with the kids? Volunteers sitting in the back rather than with the kids during large group time? Volunteers coming unprepared and looking at their lesson during large group time instead of focusing on the kids? Volunteers leaving as soon as the service is over rather than spending time with the kids while waiting for parents to come? Volunteers not taking time to talk with and interact with parents? Here's how to change these scenarios. 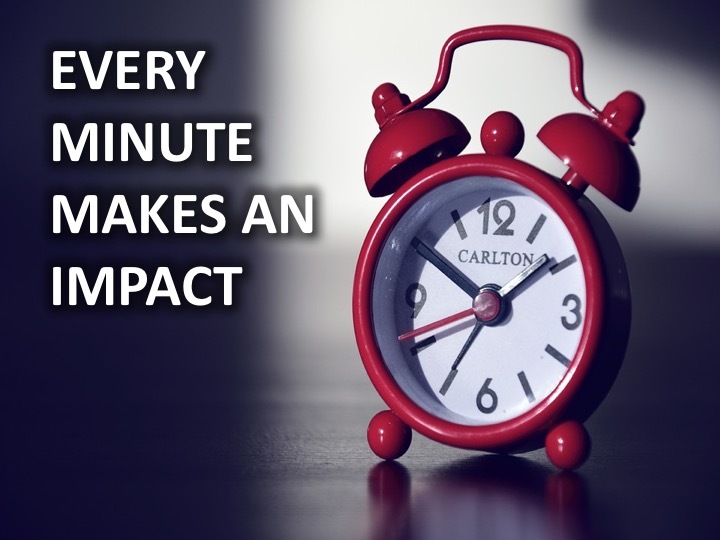 Share with your volunteers that "every minute makes an impact." Every volunteers on your team has something in common. Here it is. They want to make an impact. They want to leave a legacy. They want to know that the time they are spending volunteering is making a difference. Help them see that they only have a small window of time each week to invest in the kids and parents and every single minute they spend investing in them makes a difference. It's in the seemingly small conversations before service where volunteers can make the biggest connection with kids. It's in the quick conversations at pick-up and drop-off where volunteers can encourage parents. It's in the 3 minutes of a worship song that volunteers can model what it means to worship God. It's in the few minutes after service that volunteers can speak life into kids while waiting with them for their parents. It's in the first minute that volunteers can make new guests feel comfortable and welcomed. Time spent investing in kids and families is never wasted. Every single minute is valuable. Every single minute presents an opportunity to make a significant impact in their life. When you help volunteers catch this vision, they will show up on time. They will come prepared. They will be intentional about what they say to parents at drop-off and pick-up. They will engage with the kids before, after and during the service. We are in a race to children's hearts. Just like a minute matters in the outcome of a physical race, a minute matters in the outcome of this spiritual race.